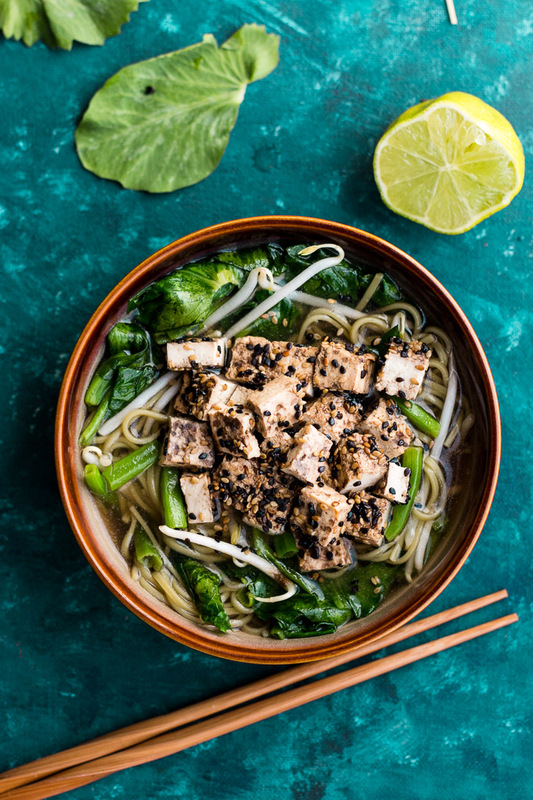 Soba Noodles in Shiitake Mushroom Broth with Sesame Crusted Tofu and Pea Shoots is the vegetarian version of my Turmeric Ginger Chicken Barley Soup. By appearance and taste, these two soups seem to have nothing in common. But both were tailored for the way they tasted as much as what they could do for your body while sick. Shiitake mushrooms help bolster your immunity. They also add a ton of “meaty” flavor to vegetable broth, which is the base of this soup. I played around with the broth, adding miso and coconut aminos. But in the end, I by far liked the plain broth + salt and pepper the best. I actually threw out the miso version. Soba noodles are the second part of the base. They are made out of buckwheat flour, which is high in protein, fiber, and antioxidants. I grabbed the Cha Soba (green tea noodles) because I was intrigued. Also matcha green tea is high in antioxidants, chlorophyll, and vitamins so I thought it couldn’t hurt right? Tofu is the “meaty” protein topping. Protein is very important to healing. It’s why after surgery, as soon as you go from NPO (nothing by mouth) to full liquids, you get a nutritional drink that has a TON of protein. When sick it’s best to stick to easily digested protein like chicken, or tofu if you’re vegetarian. I marinated and pan-fried the tofu because I wanted each of the soup’s toppings to have some flavor, since the broth is simple. Pea shoots are my new favorite green. The stems are hollow, the leaves medium sized, and they taste like peas, which is AWESOME. When stir fried very briefly and then sprinkled with Himalayan Pink Salt, they have amazing flavor. I separated the stems and leaves for easier eating, but both go into the soup. 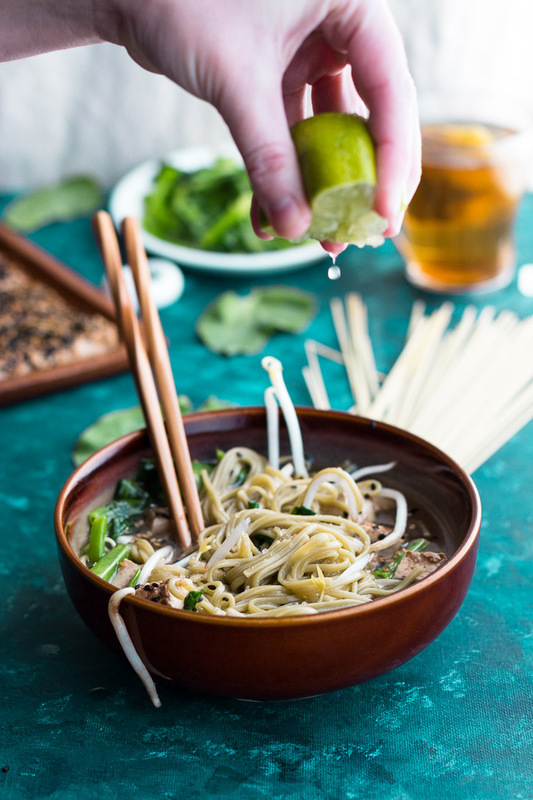 Bean sprouts are always a good idea for broth soups, a sprinkle of salt, and a generous squeeze of lime juice helps elevate all the flavors. 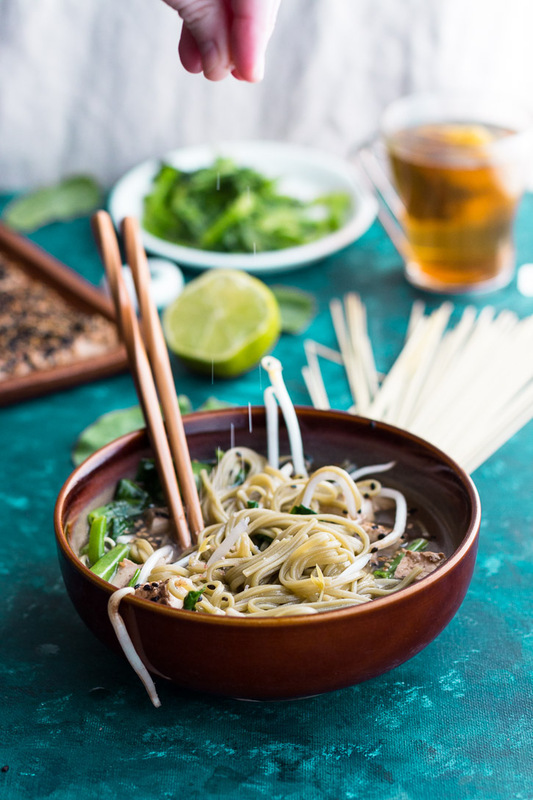 The recipe for this Soba Noodles in Shiitake Mushroom Broth seems kind of overwhelming. But it’s actually really easy. While the vegetable broth cooks (40 minutes), press the tofu (30 minutes). While the broth cools a little before you strain it, prepare the ingredients to marinate the tofu (30 minutes). As the tofu marinates, strain the broth, heat a pot to boil the noodles in, and stir fry the pea shoots. 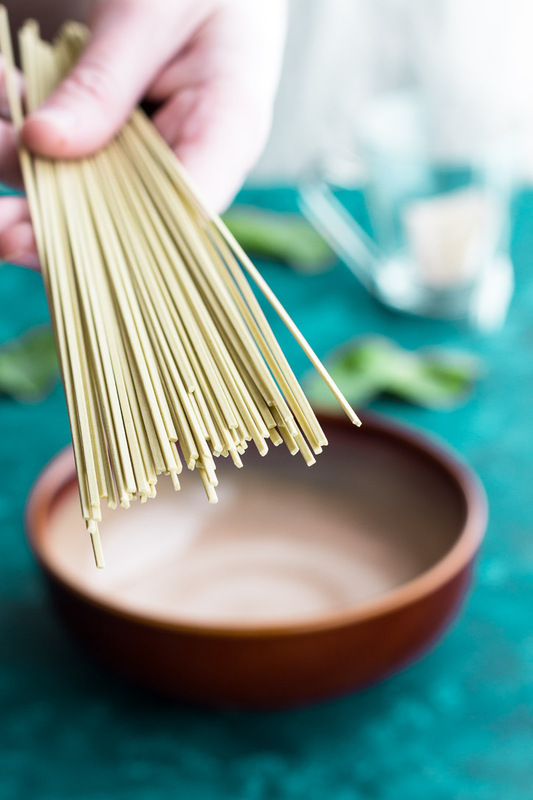 Soba noodles are great because you cook them for 6 to 8 minutes, drain, dump in cold water and massage, and then drain again. When you cook them this way they can sit for long periods of time and not stick together. You can simply add them to your hot broth and presto-they’re ready to eat. Prep some of the ingredients on different days too to make it even easier. The vegetable broth can be made weeks in advance. The recipe makes plenty of broth so you can use it for other dishes. Press and marinate the tofu the day before. For leftovers, store everything separately. 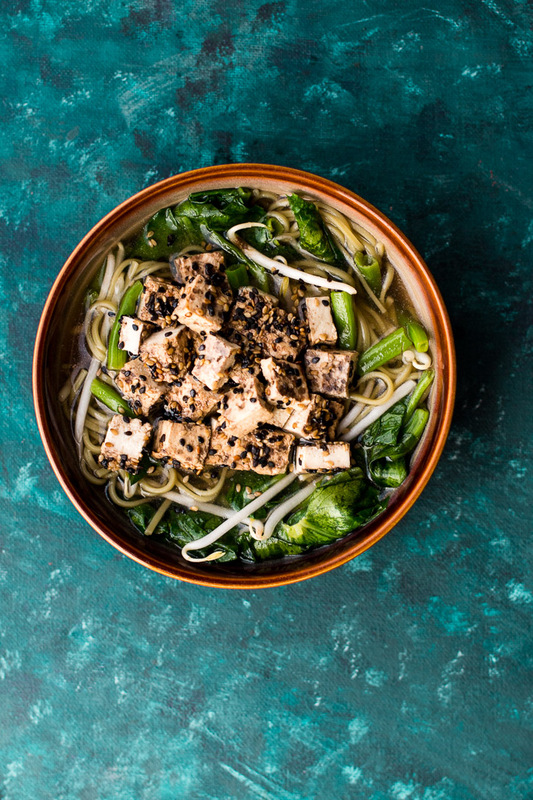 The tofu, pea shoots, and noodles can simply be added into the reheated broth. I recovered pretty well from my cold but I have a sneaky suspicion that it has migrated down to my gut. I feel completely better and my symptoms are gone. But I’ve been having problems with my digestion and can’t seem to find anything to eat that won’t upset it a little (or a lot). Back to the drawing board. 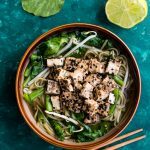 Soba Noodles in Shiitake Mushroom Broth with Sesame Crusted Tofu and Pea Shoots has a simple, fast, and flavorful broth that serves as the base of this delicious, healthy, and vegetarian dish. Combine everything into a large pot. Bring to a boil on high heat. Reduce heat to low and cook for 40 minutes. Pour broth over a fine-mesh sieve and discard the solids. Let the broth cool to room temperature, pour into mason jars, and either use immediately or freeze. Place the tofu block on a baking sheet covered with a clean dishtowel and a layer of paper towels. Pull the dishtowel and paper towels over the top (the tofu should sandwiched). Put another baking sheet on top of the tofu and place heavy items on top. Press the tofu for at least 30 minutes (this can be done the day before). For the marinade, mix everything together except for the sesame seeds and vegetable oil. Uncover the tofu and cut it into 10, 1/2 inch rectangles. Lay the tofu in a baking dish and pour the marinade on top. Marinate for 30 minutes, turning the tofu once. Mix the sesame seeds and salt together in a shallow dish. Pick up a tofu rectangle, shake off excess marinade, and dip both sides in the sesame seeds. Repeat. Heat 1 tablespoon vegetable oil in a skillet on medium heat. Once oil is hot, add the tofu, cooking each side for 1 minute. Set aside. Heat oil in a large skillet or wok. Once oil is hot, add the pea shoots and stir-fry 1 to 2 minutes until slightly wilted but still crisp. Transfer to a plate and sprinkle with the coarse Himalayan salt. Heat the vegetable broth on medium heat until it starts to boil. Reduce heat to low. Bring a pot of water to boil. Add the soba noodles, let the water return to a boil, and then reduce heat until the water is at a simmer. Cook for 6 to 8 minutes. While the noodles are cooking, fill a large bowl with cold water. Drain the noodles in a colander and then dump them into the cold water. Use your hands to rub the noodles, washing them of excess starch. Drain the noodles again and set aside until you’re ready to use them. Pour about 1 cup of broth into serving bowls. Separate the noodles equally among the bowls. Top with Sesame Crusted Tofu (cut into cubes if desired for easier eating), Stir Fried Pea Shoots, bean sprouts, a generous squeeze of lime juice, and more salt if needed. If you don’t have a pot that can fit 16 liters of water, don’t worry. Just fill up your biggest one. Anything goes for broths. You can put vegetable skins, ends, parts of vegetables you’re not going to use (carrot top greens, etc.). But for this recipe, don’t skim on the shiitakes-it’s where the flavor comes from without adding much else to the broth besides salt and pepper. At your average grocery story, shiitakes can be very expensive. But if you go to an Asian grocery or market, you can get them at a very nice price. If you can’t find decently priced fresh shiitake mushrooms you can always use dehydrated mushrooms, which are readily available these days in most grocery stores. 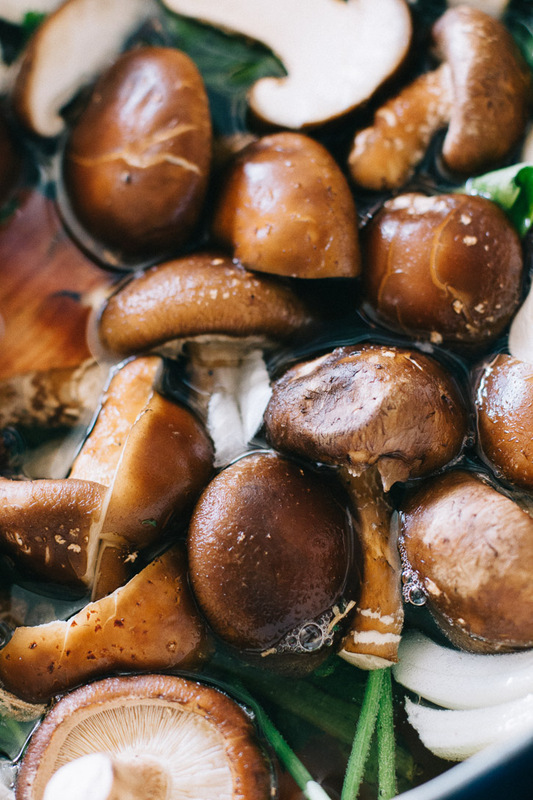 12 to 15 mushrooms should do and dehydrated mushrooms actually have more flavor than fresh. The Shiitake Vegetable Broth can be made ahead of time and frozen for later use. You can press the tofu in advance. After you’ve pressed it, cut it into 10, 1/2 inch rectangles and refrigerate them in an air tight container for the next day. The tofu fries better as rectangles but they can easily be cut into cubes for easier eating. All the elements of this can easily be stored separately, making it a good option for serving throughout the week. Soba noodles reheat nicely by adding the cold noodles to the hot broth. Thanks Yaron! I hope you enjoy it! Such rad images! Love the squeeze of lime. I’ve got to get into cooking and not just baking… and this is seriously inspiring me to start! Thanks Rebecca! I’ve actually been wanting to bake more! Hopefully we can inspire each other! So many of my favourite things all in one bowl! 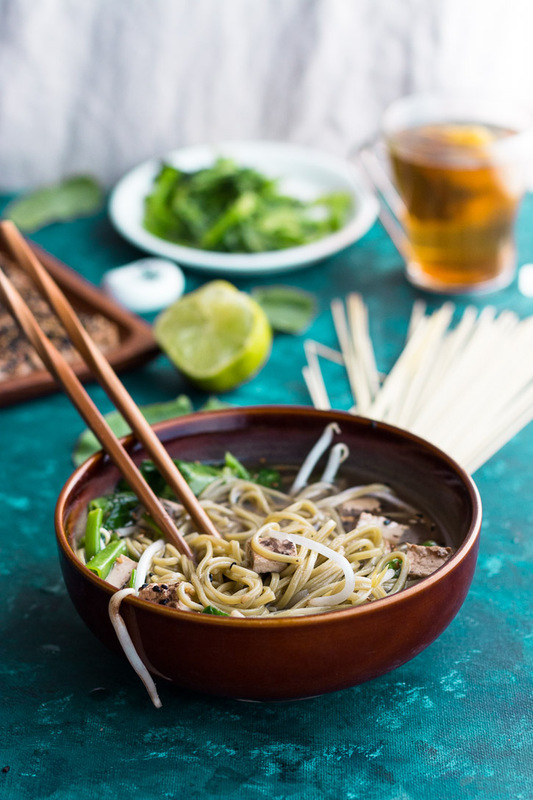 I’m a big fan of mushrooms and bean sprouts and have yet to try green tea soba noodles (but I bet they are fantastic). This looks absolutely DEEEELICIOUS!! I would happily serve myself a huge bowl of this and slurp away!! So perfect, especially for today (it’s in the minus twenties with the wind chill….brrrrrrr). Thanks so much Dawn! You can really smell the matcha when the noodles are dry but the taste is pretty subtle. And oh my gosh I would seriously die. That is way too cold! Everything about this sounds absolutely wonderful! 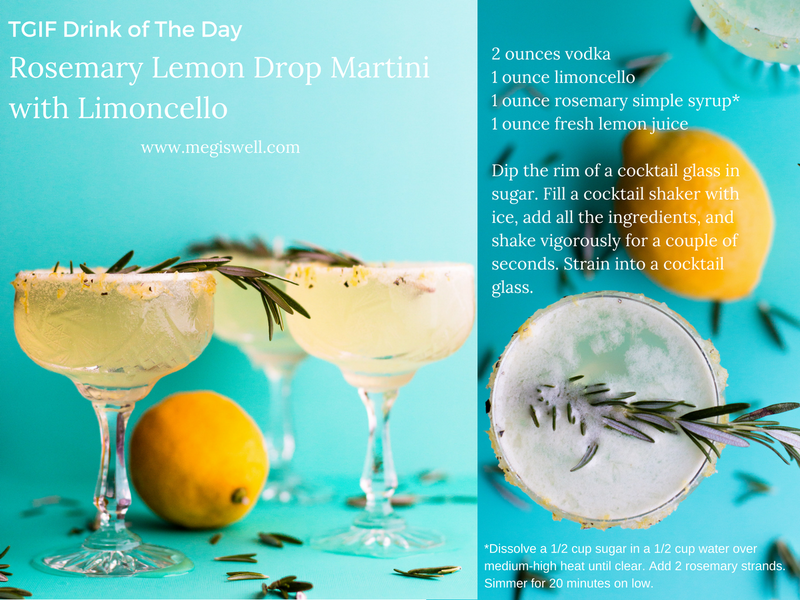 It’s currently snowing, raining, sleeting, and just plain gross here in New England….a bowl of this would be perfect! This looks and sounds amazing. And your photos are simply stunning! I am totally drooling! This is my kind of meal and I wish I were having it for dinner tonight. Looks so good! I hope you feel better soon! 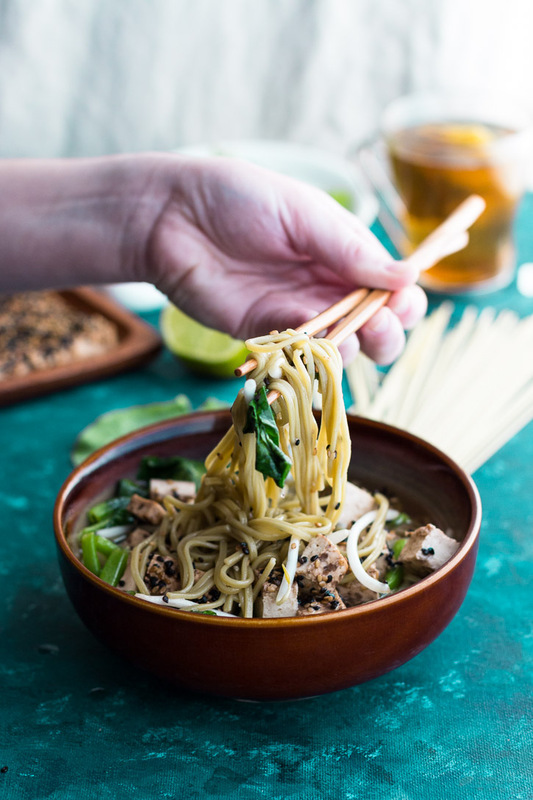 This soba Noodles recipe not only look amazing but it sounds like it’s going to taste better! Bookmarking to try soon. What a delicious looking meal! With the snowy weather today, it looks like a perfect comfort food. Yikes snow! Sorry that’s my California reaction. Thanks so much and stay warm!